Autumn is in full swing and winter is around the corner. The bicycles roll on. The good people at SWIMS in Norway have already developed fine products to protect your bespoke footwear from the seasonal elements. Here in Copenhagen you'll have fenders on your bike to protect your much-loved Paul Smiths or your trousers/stockings to some degree from the spray when riding to work but when you invest in quality footwear and clothing, it's not a bad idea to have a bit of extra protection. Like the dapper chap above and below. The City Slipper is the new product from SWIMS this season. Given the fact that urban cycling in high heels is a normal part of life in Copenhagen and many other European cities, it's a welcome addition to the urban landscape. Whether you are just riding to work in your workhorse Louboutins or heading off to a smashing fancy do with the who's who in the evening, if the forecast calls for precipitation of any kind, why not equip yourself with the City Slipper. Like with all of SWIMS products, there is a host of colours to choose from. At time of writing, the City Slipper has yet to premiere on the SWIMS website or in the SWIMSSTORE, but they are right around the corner. SWIMS will work hard protecting your footwear, but they are apparently not designed to help you avoid frizzy hair associated with humid, moist weather. Now you know. I looked them up, and I was sad. They don't come in a size 42, not even for men. 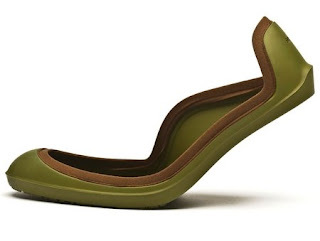 Those of us with large feet will just have to be soggy. My high heels will just have to go into protective custody for the winter. 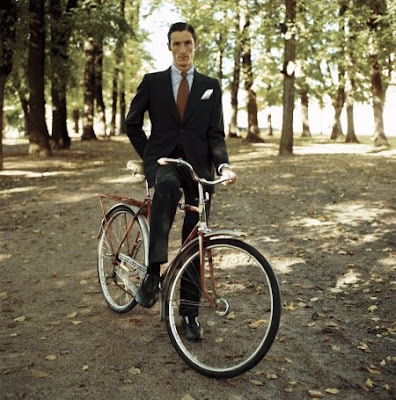 Hmmm...what does one love more, a dapper man in a classy suit, a Crescent bicycle with said man on it, Norway, or Swims? Too much to choose from!